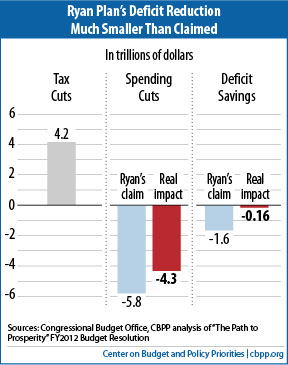 Two graphs from the Center on Budget and Policy Priorities tell you just about all you need to know about the Ryan/Republican deficit reduction plan. First, the Repub plan gives the rich some major tax cuts but doesn’t in fact do anywhere near what they claim in terms of deficit reduction Second, the Republican plan DOUBLES the amount seniors will have to pay out-of-pocket for health insurance. Take a look. View the truth.